Nagraj Manjule, a prominent Indian filmmaker from Maharashtra, has, in a short span of time, already made people take notice of him with his first few films. In 2013, he came out with Fandry, a film which openly talks about caste discrimination in rural Maharashtra. But the director hit a home run in 2016 with “Sairat”, a tale of young love originating in rural Maharashtra, set against the underbelly of the troubled caste politics of the state. This was the film which made everyone recognize the power of Indian regional cinema and Manjule’s directorial abilities, amassing huge popularity for a regional film in India and hopefully, setting the right example. But one must set aside its popularity for a while and talk about its merits as a film. The story is about the love that blooms between Parshya (Akash Thosar) and Archi (Rinku Rajguru). While Archi hails from an influential family, Parshya is a bright boy from a lower-caste who works in a garage with his friends and helps out his father with his work as a fisherman, along with pursuing college education with the hope of a better future. And as it usually turns out in these stories, their moments of young, innocent love are short-lived as it undergoes various complications. “Sairat” follows the template of the classic Romeo-Juliet story, very much so, a template which cinema across the world, including India, has done way too often. But this film proves that one can stick to the basic template and yet create a viewing experience like no other. It does so by engaging freely with the troubling social realities of the place in which it is set, giving viewers a window into a world they are blissfully unaware of. A promising subject like this is backed by an assured directorial hand, laced with technical precision and the power of good old conventional storytelling which is well executed. Its hard to say how much of the Romeo-Juliet influence is conscious but it is most likely so, as the film has its own version of the balcony scene, while a delightful musical number plays in the background. The story too bears too many similarities with the original Shakespearean play but that is not necessarily a bad thing, as the story stays rooted to its world and the detailing in the script is commendable. What makes the film more exciting is its conscious nods to the conventional romances of Hindi cinema, but the director subverts these tropes by juxtaposing dream-with-reality. While the first part of the film’s three hour run time is dedicated to the blossoming of romance, with songs shot in slow-motion across the rural backdrop of Maharashtra, the second part is a gritty look at the adversities the young people in love have to face, shot realistically, without songs, fully exploring the complications that come with eloping from one’s home. The cinematography explores the intricacies of the story well, as the lush green fields serve as an idyllic setting for romance to blossom while in the second half, the camera explores the hostility of suddenly moving to a new city and living in the slums. The watertight editing never lets the pace of storytelling down and makes it flow in such a way that the viewing experience becomes increasingly immersive. What adds texture to a story like this is often its music and Ajay-Atul does a great job in composing songs which are memorable and add emotional heft to the storytelling. Sequences to watch out for would be the aforementioned dance sequence set to the song “Zingaat: composed by Ajay-Atul, an early sequence set against villagers bathing in a well, and an extended sequence in the second half laden with the right amount of anxiety and emotional intensity after the lovers quarrel. What makes the movie particularly endearing is the characterization and performances of the lead couple. While Akash Thosar brings the right body-language and details to his portrayal, Rinku Rajguru delivers a performance so natural and power-packed, that it fills the viewer with wonder and awe. These young actors, in their initial film roles, show incredible maturity and depth. 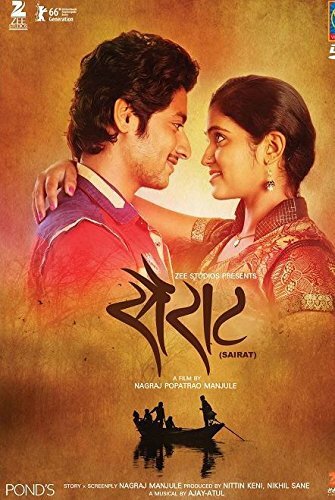 Sairat is an important film in this regard, since, not only shows that mainstream storytelling can be done with incredible skill and social consciousness, unlike the many placid conventional romances made in India, but is a legitimate work of a filmmaker who has a unique voice, and all the tricks in his arsenal to pull off a film like this.